After the release of Android 9.0 by Google, we can see a number of custom ROM are building for various devices. Google uploaded Android Pie source code to AOSP a few days back, and now developers started working on it. This time, so many devices are getting Android Pie via the official and unofficial route. This is mainly due to the Project Treble support. If your device got AOSP Pie update, it is certain that you need Google’s home application like Play Store, Maps, Google Assistant, Play Music, etc. So, in order to get access to all the Google Apps in Android 9.0 Pie ROM, you need to flash GApps for using a custom recovery. We have provided a list of Android 9 GApps based on the device architecture. Make sure to download the correct one based on your requirement. But keep in mind that, you only need to flash these GApps on Android Pie, if the ROM is AOSP and it does not have GApps integrated from before. Also, these GApps are very new, and in an initial Alpha stage. So do not expect a perfect experience. We have tested these GApps on some of our device running on Android 9.0 Pie GSI (Project Treble based) ROM, and they are working fine. We are sharing GApps here based on the ARM and ARM64. So, before downloading, please do check your device architecture. We also have some device-specific GApps below; the developers share that. Android 9.0 Pie update: Install Project Treble [GSI] ROM right now! These GApps should be working good on all the devices running Android Pie with a given architecture type. ARM and ARM64 are the most popular architecture type in Android devices. If you are not sure about your device architecture, you can check it using CPU-Z App from Play Store. Below are the download table for Android Pie GApps. We have separated them on the architecture basis (like ARM, ARM64, etc.). 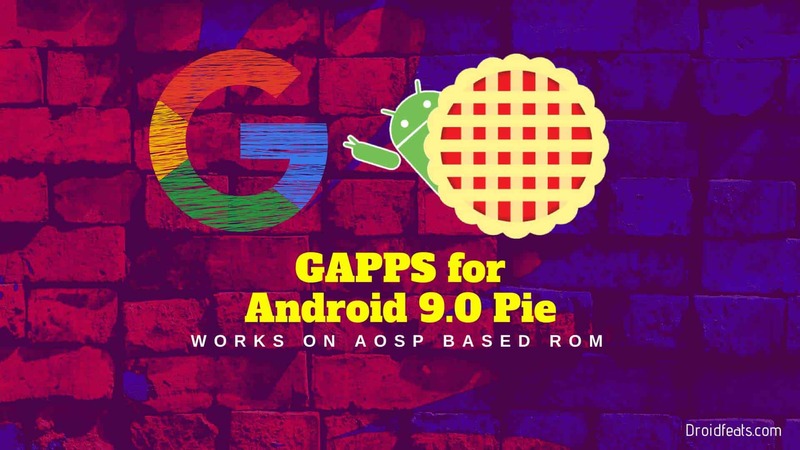 These are some GApps that developers build specifically for Project Treble (GSI) Android 9.0 Pie ROM. Generally, GApps works fine based on Architecture type as given in the above table. But since all the things related to Android Pie are in the alpha mode, there may be some bugs. So, if a developer built a GApps for a specific device, you must use that. These device-specific GApps might also work on the other device that has the same hardware specification. That’s all! If any of these GApps is not working for you, please let us know by commenting below. Also, mention the device model with architecture. We will reply you back with the updated links if it is available. How to install Android Pie on Asus Zenfone Max Pro M1? How Samsung’s Galaxy S line-up has evolved over time? How to live stream PUBG mobile on Facebook and YouTube?